خدادادی سنگده, جواد, حقانی, مجتبی, طاهری, مهدی, رضایی آهوانویی, محسن, رنجگر, پریسا. (1396). رابطه امیدواری، تجارب معنوی روزانه و کیفیت زندگی در دانشجویان مجرد دانشگاه تربیت معلم تهران سال تحصیلی 91-90. سلامت جامعه, 9(2), 38-48. جواد خدادادی سنگده; مجتبی حقانی; مهدی طاهری; محسن رضایی آهوانویی; پریسا رنجگر. "رابطه امیدواری، تجارب معنوی روزانه و کیفیت زندگی در دانشجویان مجرد دانشگاه تربیت معلم تهران سال تحصیلی 91-90". سلامت جامعه, 9, 2, 1396, 38-48. خدادادی سنگده, جواد, حقانی, مجتبی, طاهری, مهدی, رضایی آهوانویی, محسن, رنجگر, پریسا. (1396). 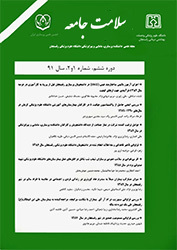 'رابطه امیدواری، تجارب معنوی روزانه و کیفیت زندگی در دانشجویان مجرد دانشگاه تربیت معلم تهران سال تحصیلی 91-90', سلامت جامعه, 9(2), pp. 38-48. خدادادی سنگده, جواد, حقانی, مجتبی, طاهری, مهدی, رضایی آهوانویی, محسن, رنجگر, پریسا. رابطه امیدواری، تجارب معنوی روزانه و کیفیت زندگی در دانشجویان مجرد دانشگاه تربیت معلم تهران سال تحصیلی 91-90. سلامت جامعه, 1396; 9(2): 38-48. مقدمه: در مورد نقش و اهمیت مذهب و معنویت در زمینه سلامتی و بیماری علاقه رو به رشدی وجود دارد و مطالعات تجربی متعدد، نشانگر روابط معنی­دار میان مذهب، معنویت و سلامت هستند. با توجه به اهمیت امیدواری در چگونگی بهزیستی روانی و کیفیت زندگی، پژوهش حاضر با هدف بررسی رابطه بین امیدواری، تجربه معنوی و کیفیت زندگی دانشجویان صورت گرفت. مواد و روش ­ها: این مطالعه توصیفی با جامعه آماری کلیه دانشجویان کارشناسی دانشگاه تربیت معلم تهران در سال تحصیلی 91-90 انجام گرفت. تعداد ۳۵۰ نفر با استفاده از روش نمونه­گیری تصادفی خوشه­ای چند مرحله­ای به عنوان نمونه انتخاب شدند. برای جمع­آوری داده­ها از مقیاس کیفیت زندگی سازمان بهداشت جهانی، امیدواری اشنایدر و تجارب معنوی روزانه استفاده گردید. به منظور ارائه و تجزیه و تحلیل داده­ها از روش­های آمار توصیفی، آزمون t، و تحلیل رگرسیون چندمتغیری استفاده شد. یافته ­ها: وجود نقش پیش‌بینی کننده ابعاد امیدواری برای متغیر کیفیت زندگی مورد تأیید قرار گرفت(05/0p<). مدل ارائه شده توانست ۳۱/۰ واریانس متغیر کیفیت زندگی را تبیین کند (۵۷/۷۵F=، 00۱/۰p<). نتایج آزمون تی برای تفاوت پسران و دختران در متغیرهای کیفیت زندگی، امیدواری و تجربه معنوی به ترتیب ۹۴۷/۱-، ۴۵۳/۰ و ۸۳۶/۳- گزارش شد. با توجه به نتایج مشاهده شده وجود نقش پیش‌بینی کننده برای متغیر کیفیت زندگی مورد تأیید قرار گرفت. نتیجه­ گیری: نتایج تحلیل رگرسیون بیان می­کند که امیدواری و تجارب معنوی روزانه می­توانند کیفیت زندگی را در دانشجویان پیش­بینی کنند. نتایج نشان داد که بین کیفیت زندگی و امیدواری دانشجویان دختر و پسر تفاوت معنی­داری وجود ندارد، اما در تجارب معنوی روزانه این تفاوت معنی­دار است. نتایج تحقیق حاضر نشانگر اهمیت تجارب معنوی روزانه و کیفیت زندگی در پیش­بینی امیدواری دانشجویان است. 1PhD student of Counseling, Faculty of Psychology and Educational Sciences, Kharazmi University Tehran, Iran. 2MSc Student ,Faculty of Psychology and Educational Sciences, Allameh Tabatabai University Tehran ,Iran. 3Phd student of Health Psychology, Faculty of Psychology and Educational Sciences, Kharazmi University Tehran, Iran. Introduction: Hope plays an important role in the psychological well-being and quality of life. There is a growing interest on the importance of religion and spirituality on health and disease. The aim of the present study was to investigate the relationship between hopefulness, spiritual experiences and students' quality of life. Material and Methods: The research design was descriptive- correlation and the research population included the students of kharazmi University of Tehran from which 350 student were selected through random cluster sampling method. World Health Organization quality of life scale, Snyder,s hopefulness, and Daily spiritual experiences were used for data collection. Results: The predictive role of the hopefulness dimension for the quality of life variable was approved. The results of T-test for the difference between male and females in variables of quality of life, hopefulness and spiritual experience were-1.947, 0.453 and 3.836 respectively. The model which is presented could make clear 0.31 variance of variable of life quality (p< 0.1 & F = 75.57). According to the observed results, the predictive role of the life quality variable was approved. Conclusion: Result of regression analysis states that hopefulness and daily spiritual experiences can predict the student’s life quality. Analyzing the data showed that there is no significant differences between quality of life of male and female students, but this difference is significant in daily spiritual experiences. Schalok RL, Brown I, Brown R, Cummins RA,Felce D, Matikka L, et al. Conceptualization, measurement, and application of quality of life for persons with intellectual disabilities: Report of an international panel of experts. Journal Information 2002; 40(6): 457-70. Liu L. Quality of life as a social representation in China: A qualitative study. Social Indicators Research. 2006;75(2):217-40. Smith AE, Sim J, Scharf T, Phillipson C. Determinants of quality of life amongst older people in deprived neighbourhoods. Ageing and Society 2004;24(05):793-814. Ng SL. Subjective residential environment and its implication for quality of life among university students in Hong Kong. Social Indicators research 2005; 71: 467-89. Hack TF, Pickles T, Ruether JD, Weir L, Bultz BD, Mackey J, et al. Predictors of distress and quality of life in patientsundergoing cancer therapy: impact of treatment type and decisional role. Psycho‐Oncology 2010;19(6):606-16. Lopez SJ, Snyder CR.Handbook of Positive Psychology. Oxford University press; 2009: 125-70. Poage ED, Ketzenberger KE, Olson J. Spirituality, contentment, and stress in recovering alcoholics. Addictive behaviors 2004;29(9):1857-62. Yalçın İ, Malkoç A. The Relationship between Meaning in Life and Subjective Well-Being: Forgiveness and Hope as Mediators. Journal of Happiness Studies. 2014:1-5. Cheavens JS, Feldman DB, Woodward JT, Snyder C. Hope in cognitive psychotherapies: On working with client strengths. Journal of cognitive Psychotherapy 2006;20(2):135-45. Mclnnis DJ, chun H E. understanding hope and its implications for consumer behavior: I hope, There for I consume. Foundation and tends in marketing 2007; 1 (2): 97-189. Snyder CR, Forsyth DR. Handbook of social and clinical psychology: The health perspective: Pergamon Press; 1991. Leon RC.(Dissertation). Factor associated with forgiveness in intimate relationships and the impact of hope-focused marriage therapy. Virginia:Regent University; 2008: 52-5. Mabe PA, Josephson AM. Child and adolescent psychopathology: spiritual and religious perspectives. Child and adolescent psychiatric clinics of North America 2004;13(1):111-25. Culliford L. Healing from within: spirituality and mental health. Advances in Psychiatric Treatment 2005; 8: 1-9. Shaw BM, Bayne H, Lorelle S. A constructivist perspective for integrating spirituality into counselor training. Counselor Education and Supervision. 2012; 51(4): 270-80. Piedmont RL. Assessment of spirituality and religious sentiments (ASPIRES) scale. Encyclopedia of Quality of Life and Well-Being Research 2014:258-9. Ho MY, Cheung FM, Cheung SF. The role of meaning in life and optimism in promoting well-being. Personality and individual differences 2010;48(5):658-63. Bartlett SJ, Piedmont R, Bilderback A, Matsumoto AK, Bathon JM. Spirituality, well‐being, and quality of life in people with rheumatoid arthritis. Arthritis Care &Research 2003;49(6):778-83. Underwood LG, Teresi JA. The daily spiritual experience scale: Development, theoretical description, reliability, exploratory factor analysis, and preliminary construct validity using health-related data. Annals of Behavioral Medicine 2002;24(1):22-33. Cohen S, Underwood LG, Gottlieb BH. Social support measurement and intervention: Aguide for health and social scientists. 1nd ed. New York: Oxford University Press; 2000: 271-73. Snyder C, Lopez SJ, Shorey HS, Rand KL, Feldman DB. Hope theory, measurements, and applications to school psychology. School Psychology Quarterly 2003;18(2):122-39. Snyder C, Rand K. Hopelessness and health. Encyclopedia of health and behavior 2004; 2: 521- 23. Bussing A, Ostermann T, Matthiessen PF. Role of religion and spirituality in medicalpatients: confirmatory results with the SpREUK questionnaire. Health and Quality of Life Outcomes 2005; 3 (1): 10. Butler MH, Gardner BC, Bird MH. Not Just a time – out: Change dynamics of prayer for religious couples in conflict situations. Family Process 1998; 37(4): 451-78.